Currently based in New York and working with the soprano saxophone, open-circuit electronics, and a 1/4" tape player. These three instruments and areas of interest do not overlap in performance or practice aside from the saxophone being used in conjunction with the tape player/feedback to produce music based around the phenomena of psycho-acoustic structures. 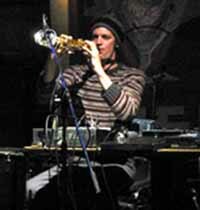 Works with improvisation in music and other contexts, and in this area he has performed all over the US in many situations and maintains regular playing relationships with artists such as David Kendall, Chistopher Cogburn, Jeremy Drake, Gust Burns, Dan Breen, Andrew Lafkas, Jonathan Zorn, Rachel Thompsen, and many others. Having spent the years of 1997 to 2005 in Portland, Oregon, and being very involved in the creative improvised music community of the Northwestern US, many fruitful and long term musical relations were produced such as the duo GOD with Leif Sundstrom, an electronic collaboration with guitarist Doug Theriault, and various works with Jean Paul Jenkins and Joseph Foster. During this time he was also continually developing a solo language on the saxophone and with electronics that is now being applied to a search for something beautiful in form and content, whether in collaboration or solo work.